Urine RBP4: best biomarker of impaired renal proximal tubule function and risk stratification of insulin-resistant patients. 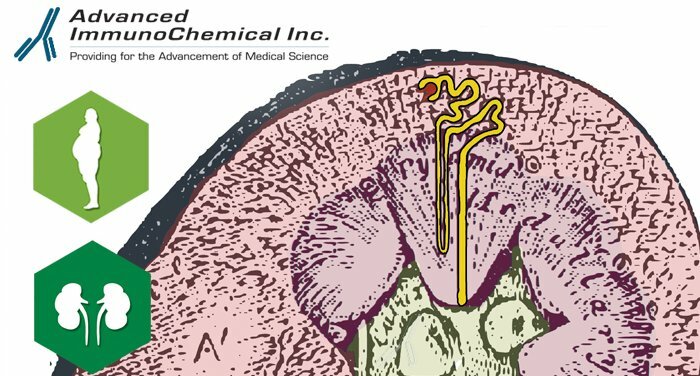 - Advanced ImmunoChemical Inc.Advanced ImmunoChemical Inc.
Home » Article » Urine RBP4: best biomarker of impaired renal proximal tubule function and risk stratification of insulin-resistant patients. Urine retinol-binding protein4 (RBP4), a carrier protein for vitamin A in plasma, is arguably the most sensitive biomarker of human proximal renal tubular function known. Advanced ImmunoChemical is pleased to offer anti-human RBP4 monoclonal antibodies, as well as purified endogenous RBP4 for quantitative detection of circulating RBP4. Urine RBP4 AssayNotes and product information. Impaired tubule function is found in many acquired and hereditary diseases which are not usually detected by conventional means of glomerular filtration estimated by serum creatinine. Increased urinary RBP4 levels are found in patients with dysregulation of glucose metabolism and related to various cardiometabolic risk factors including insulin resistance, inflammation, and microalbuminuria, and premature arteriosclerosis and generalized vascular dysfunction (1,2,3,4). Urine RBP4 levels correlate positively with serum hsCRP levels to show a relationship between urinary RBP4 excreation and systemic inflammation associated with insulin resistance in humans (5). Urine RBP4 measurement enhances study of a number of patient groups: Fanconi Syndrome, drug nephrotoxicity and renal impairment groups and paraprotein diseases. Yang, Q., et al. (2005) Serum RBP4 contributes to insulin resistance in obesity and type 2 diabetes. Nature 436, 356-362. Graham T., et al. (2006). RBP4 and insulin resistance in lean, obese, and diabetic subjects. New Engl J Med 354 (24), 2552-2563. Qi, Q. et al. (2007) Elevated RBP4 levels associated with metabolic syndrome in Chinese people. J. Clin. Endocrinol Metab 92, 4827-4834. Lewis J., et al. (2008) Plasma RBP4 unlikely to be a useful marker of insulin resistance. Diabetes Res Clin Pract 80, 13-15. Ishwarlal Jialal et al. (2014) Relationship between RBP4/adiponectin and leptin/adiponectin ratios with insulin resistance and inflammation. J. Metabolic Syndrome and Related Disorders 12 (4), 227-230. Kindly visit us at www.AdvImmuno.com to see all our RBP4 references and other products related to metabolic syndrome.